Race #94 - Half #35 - Hah - thought this was 34 but it was actually 35!!! An incredible course. If you take anything away from this review, run this for the course. It's not completely difficult but is challenging. 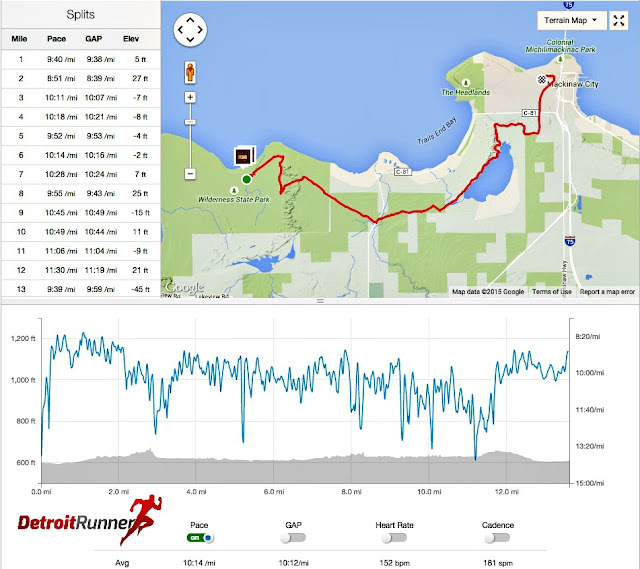 It's not super hilly but runnable. It's not overgrown but somewhat manicured(well portions). The race is well organized and well marked so it makes for a really nice beginner course. It's really a great race and an awesome place for a vacation as well. I'm already putting this on my list for next year again so I can spend the weekend camping there and running. Registration was very simple. 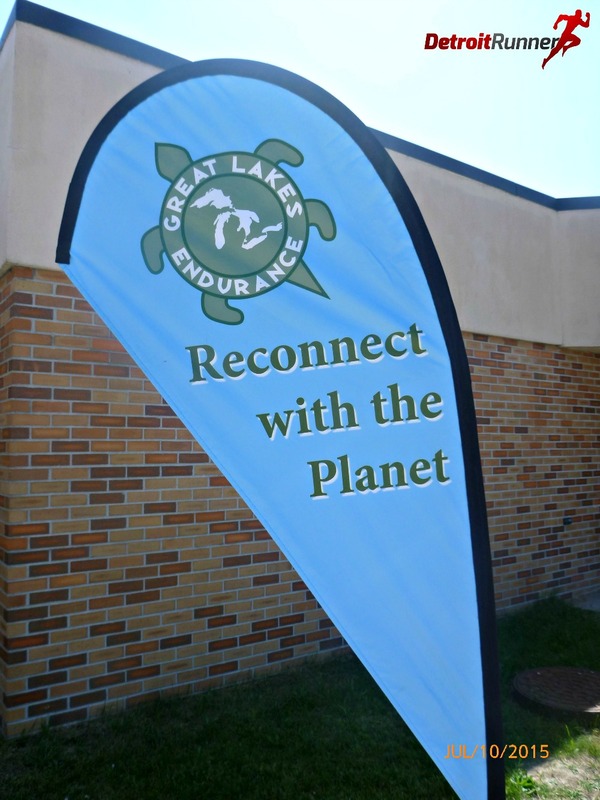 All you do is sign up via Great Lakes Endurance website and Active(dot)com and you will get an immediate email with your confirmation. Everything is done online and is very convenient. 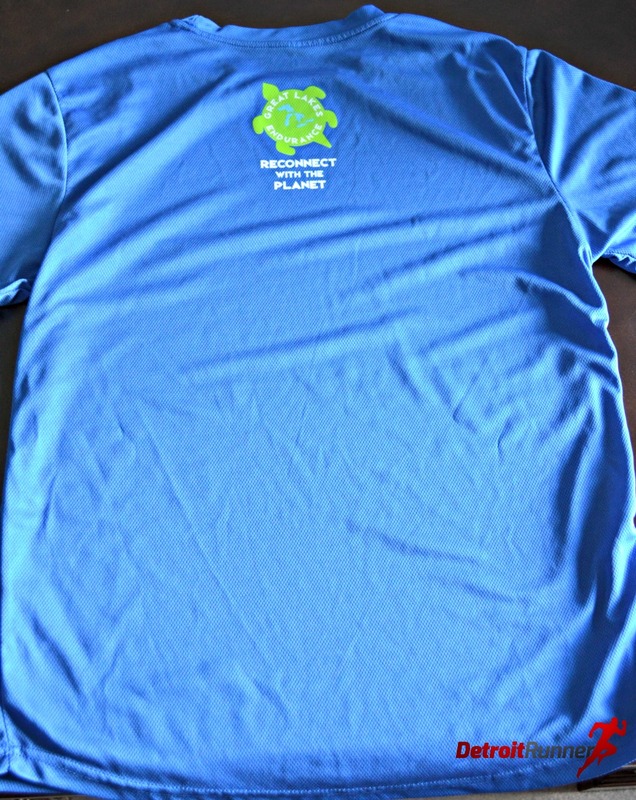 Packet pickup is held the day before the race on Friday from 3-9pm. While I like to see race day pickup as well, I can understand the race not doing it since they give you six hours to come and pick up your packet. 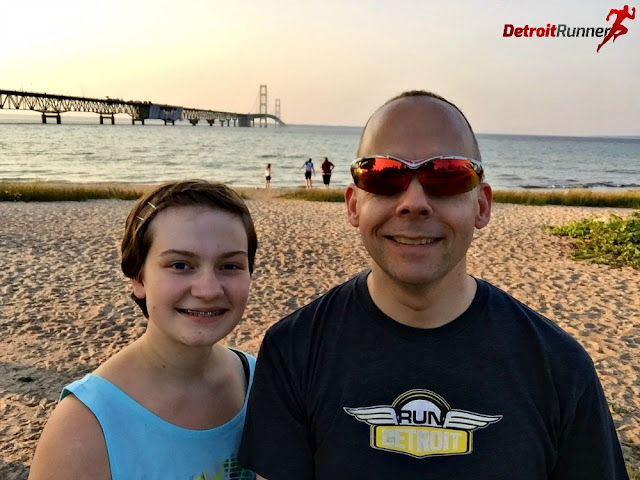 In addition, since it's out of town for most people, it's not really an issue since you would be driving up to Mackinaw City anyway the day before in order to get your packet. The pickup was located at the local High School and we were in and out in a matter of minutes. The volunteers and race director are always at the pickup and very friendly. The race had all the information for the next day if you didn't read it on their website. I find that the website has all the information you need. While I do take a picture for you guys reading this review, I don't even look at it since it's all on their website. Packet information - my friend Susan on the picture! Jeff, the race director, and his volunteers were all set up and ready for us. Yes, I realize it looks empty but given you have six hours to pick up your packet, you don't see tons of runners. While I like seeing the race grow, I also like to pick up my packet quickly so this makes things very easy. What I also like is that the race usually allows you to choose your color shirt since they bring the old years as well. A very nice option indeed! Packet pickup - small race, no line yea! Of course, their main sponsor, Merrell, was there again and I talked with the representative for a few minutes before we left packet pickup. 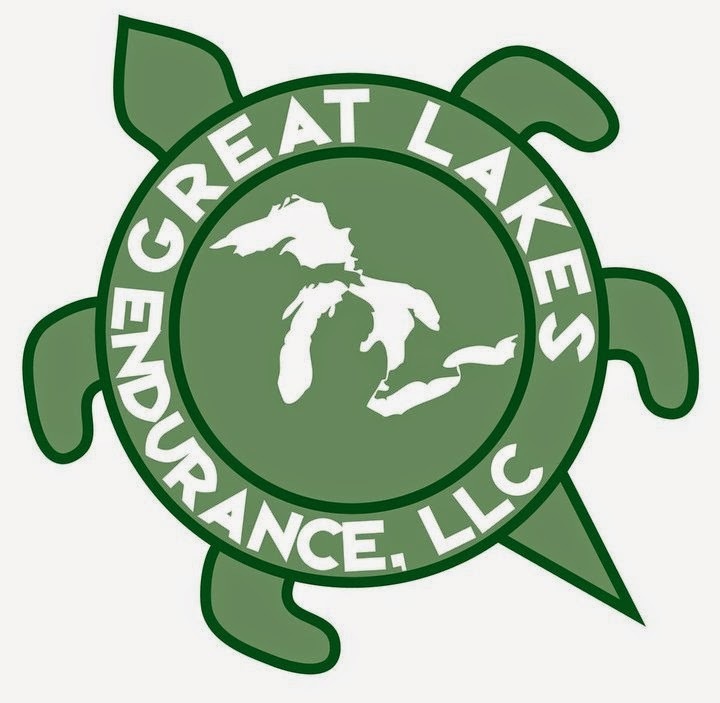 As I mentioned in my last review by Great Lakes Endurance, I don't usually post about the area since there is not much to do there but race. In this case, there is because it's in Mackinaw City. There is tons of stuff to do here besides just the race. You just need to watch how much you walk to not wear yourself out before the race. My daughter and I decided to stay at Wilderness State Park and camp the evening before. It was her first trip camping and a perfect time to go test out if she liked it or not. She did! Of course, it helped that we had an awesome campsite. We were almost on the water as you can see from the picture below. This was about 50 feet from our campsite. How's that for an awesome place to stay? After we picked up the race packet, we headed to the campground to get registered and set up our camp. Here's my daughter below getting the tent set up. We also had time to go to the City of Mackinaw in order to go to the local stores and shop and site see in the area. 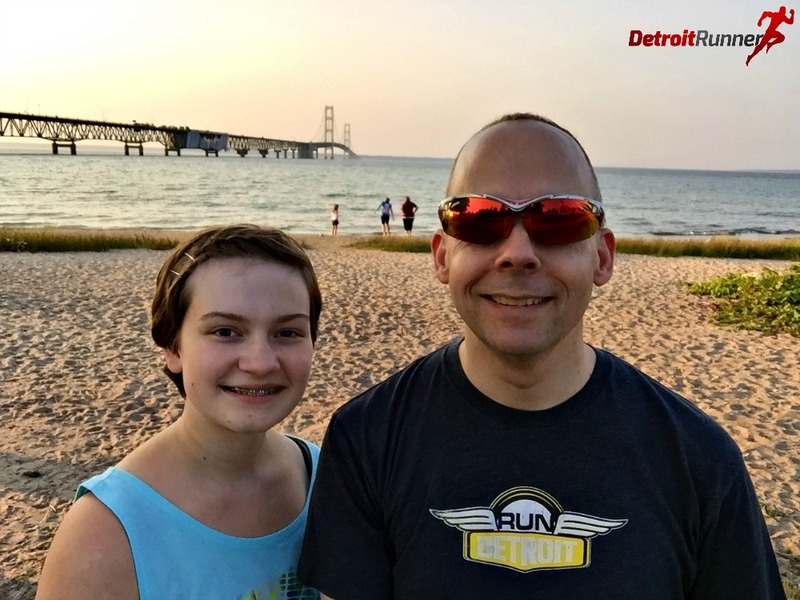 We stopped and got a nice picture by the Mackinaw Bridge as well. There is also plenty of places to eat in town if you didn't want to cook so we chose a nice Italian place with pasta. 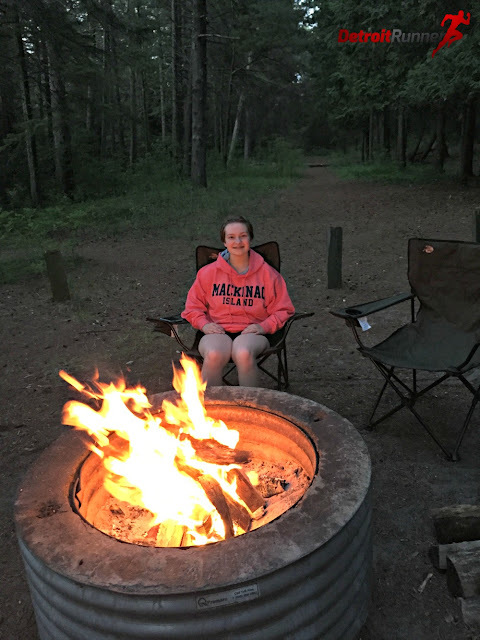 Later that evening, we went back to the campground and built a fire and relaxed for the rest of the evening. I actually didn't get to sleep until after midnight but it was worth it to spend time with my daughter plus I was "only" running the half marathon so no big deal having less sleep. The next morning I made the drive back to town to the school where the finish line was located. The race bussed us out to the start of the half marathon which was actually right across the street from our campsite. Haha! Actually it worked out great because when you were finished with your race, you could get in your car and go back to where you were staying. The campground is about 9 miles from the finish line(on the road) so not a big deal. If you wanted to drive less, you could get a campsite or hotel in town which was really close to the finish. The start area was well organized and had plenty of port-o-potties for the runners. Keep in mind there was about 125 runners for the half so this is all that was needed. As is typical, Jeff, the race director did a few announcements. We were to follow the yellow flags and always on the right! Rule #1, don't follow the running in front of you since you don't know where they are running. Always follow the flags. He also goes over the course briefly but it was marked really well and I didn't see any issue. With announcements out of the way, we were ready to run! I had no goal for this race. It was supposed to be a training run since I'm running the Grand Island full marathon next weekend (also by Great Lakes Endurance) so I didn't want to overdo it. I started way too fast in the first couple miles and then brought things back to reality. 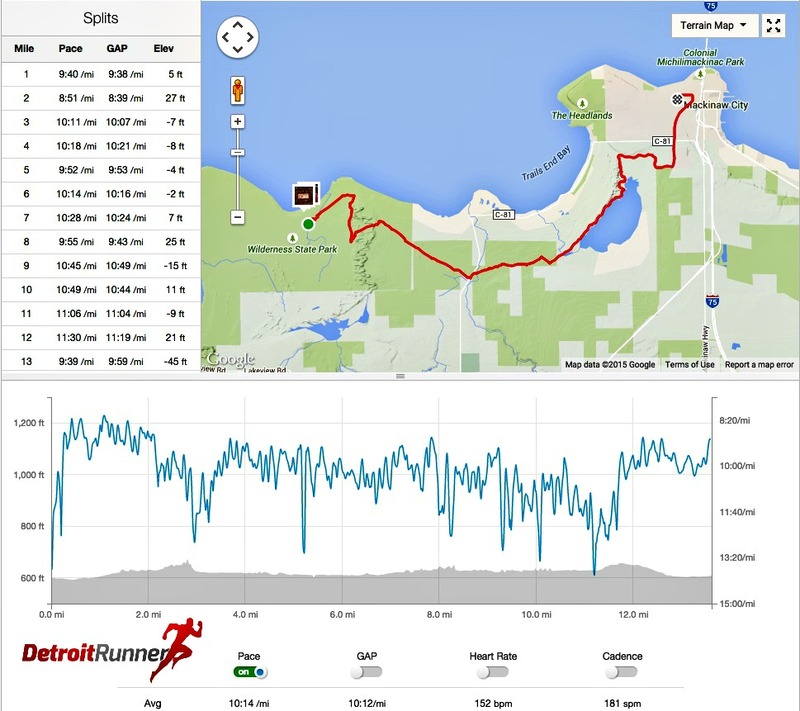 The course was running about 13.5 miles which the race director mentioned in his announcement. I was very happy with the distance being at least 13.1. As you can see on the chart, it's not really hilly but there are a few rolling hills in there but not too many. It really is a very runnable course. We start right next to a pond, which typically has tons of Mosquitoes, but this year I didn't find them to be that bad. My advice is to put on bug spray before you get on the bus which is exactly what I did. You do need to wait about 30 minutes to start running so the bug spray is important. As I mentioned, the course is just incredible. I love everything about it. It has some great variety in the trails here. The course starts out a little wider which is nice to help thin things out. Because it's also right next to the campground, it's a great place to go back to and run the following day for additional training. That's my plan for next year for my recovery run on Sunday. Below is one of my favorite parts of the trail. It's not really flat but little bumps and you are surrounded by pines on both sides of the trails. Since it was dry this year, it was nice to look around a little. I don't think I looked around enough last year due to the rain. I also sped through these pretty quickly since I wanted to get ahead of some of the slower runners. Of course, I didn't mean to go out as fast as I did but it was still very enjoyable. Before I knew it, I was at mile one! The weather was also very enjoyable. It was a little on the warm side but that would be expected in July. Overall, though, it was nice and I didn't feel like I was going to die. It was a good day and it was perfect weather for camping. You can see the yellow marked flags and also the directional signs the race had out there. I like that the race director puts these directions signs in place where you might wonder which way to go. No worries here. As you can see, the trail completely changes to a two track with a new feeling. It feels like you're on a brand new trail. I love it! Further in, you get back to the single track with some ferns but not too many. Note that the single track is not really skinny so you still have places to pass when needed. I didn't find the need to pass too many times since I seem to be keeping a fairly slow pace by this time. I remember this beautiful pond that we passed last year. It was pouring rain last year at this point but not this year! It's hard to see here but we are running right next to the pond on the trail below. No better feeling than running a trail next to the water. Soon we were back to the single track and keeping pace with other runners. The course had a road crossing(paved) that the race had coned off to help keep runner safe. We even got a few cheers from spectators here as well. It's nice to get a little cheer once in awhile especially on a trail race. The race director told me that this portion that was mowed was not mowed when he marked the course. Nice of the property owners to do this to help us runners out. I really enjoy running over bridges and this one going over the Carp River is one of my favorites. Check out how beautiful it is on the river! There are also numerous boardwalks to run across. I love running these too but mostly these are there to help us keep our feet dry. Some of the boardwalks were a little bouncy too. As you can see below, there were blue blazes on the course as well for the North Country Trail. This is nice as an extra step to know you are headed in the right direction. Still follow the yellow flags but the blue blaze is a comforting sign for me to know I know where I'm going. The thinner boardwalks were a little bouncy but helped us keep dry. I like how the vegetation is grown into the trail and makes for a really fun run. From there, we came upon Farm Lake. Oh how I love thee! How's this for an awesome view of the lake right on the trails? You follow the lake for several miles along the shore and it makes for a beautiful run. It also takes your mind off getting tired as your running. I followed the guy below me for several miles. He knew the winner of the marathon as the winner passed us as we were running. He was flying and looked so relaxed too! Uphill - this was the largest - really. There was a little sand on the trail as well but not too bad. The sand just came in small parts and was not re-occurring. As you can see, the pines came back on the course which is my favorite surface to run on. There were several more road crossings on dirt roads. We even passed a few campers that were camping out in what seemed like the middle of nowhere but there were roads leading to sites. We had a small run portion that was actually on the dirt road as well. It's not as soft as the trails but makes for a nice variety. The last part of the trail gets more technical with more tree roots and mud. I know that it looks really muddy in the picture below but the mud was fairly spongy and not the kind of mud you would lose your shoe in. There were parts of this course last year that made it extremely muddy but because it's been more dry, the course was easier this year. One turn off the trail and we were back to dirt two tracks. This went on for a little while until we hit the asphalt. As I mentioned last year, I'm not a big fan of hard surfaces. 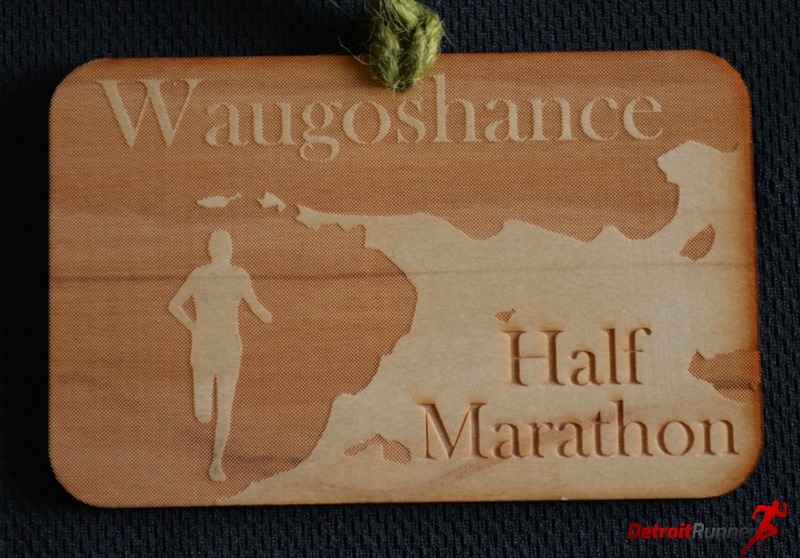 It does make for a much faster finish but for me I'd rather be on the trails. I will say that I did try and run on the side near the brush so I didn't have to run on asphalt as much and it certainly makes things easier on you. We made our way off the asphalt for a short turn to a neighborhood street. Maybe a 1/4 mile or so on the street which you could definitely run on the grass for this part if you wanted. The final push before the finish is also on a road - a road to the finish! Below is the finish line in sight right by the high school. Jeff, the race director, actually commented about my Two-hearted half shirt and I was zoned out, I didn't even realize it was him until I passed him. Haha! 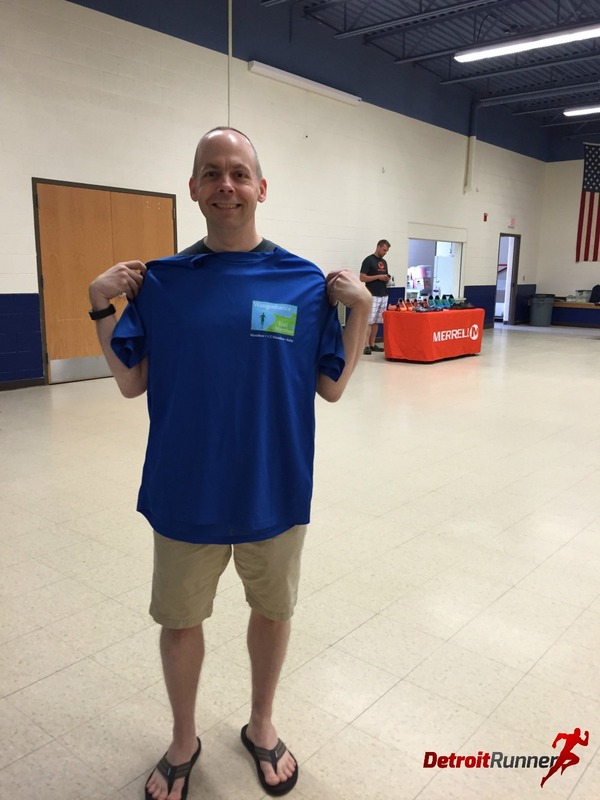 As I said, it's a good sign when you see the race director at packet pickup, the start and the finish. Success for another half marathon - half marathon #35!!!! I'm glad it was a trail race. I was so excited to get some food, I forgot to ask someone to take a picture of me at the finish line. Darn! The course had two aid stations. Both were well stocked with Heed and water as well as gel at the second aid station. 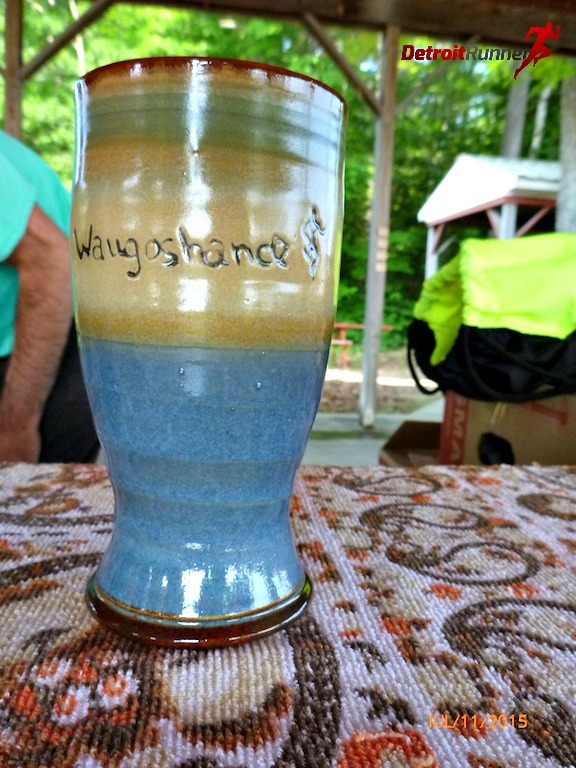 The volunteers were ready to pour water into your water bottle. While it appears like I was waiting awhile, that was not the case at all and I didn't lose any time being at the aid stations. The finish line area was very well organized. They had the timing strip set up with banners for the finish line. They had the timing crew in place to give you immediate results and there were people cheering you into the finish. After you go past the finish line and got your results, I made my way to the food area which was a short walk to the covered pavilion. The race had their usual Heed, water and cherry juice. I love the cherry juice and it really seems to help you with swelling. It's also really nice and cold on a hot day. The race also had their typical food which is bananas, fig newtons(which is what I always get) and pretzels. We were also able to get our race finisher medal here and, if you were fast, an age group award. Oh, I wanted one of those so bad but alas I was not fast. They were really nice! For your race entry fee, you received a measured and marked trail course. You received immediate results via the timing company. 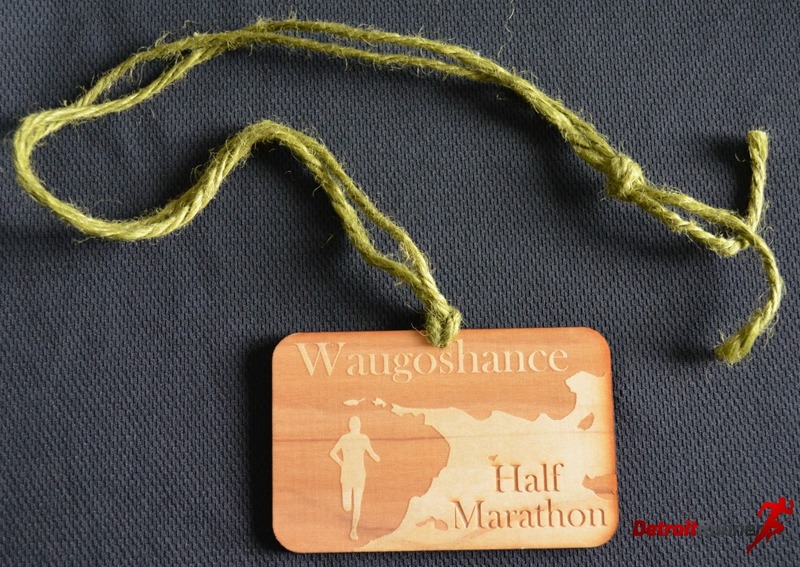 All finishers received a race medal which is a nice wooden medal. The area is a superior place to run and vacation. The tech shirt is awesome and, as I mentioned, it's nice that it's not covered in sponsors and the logo is a small chest logo. The race also had customer race bibs. 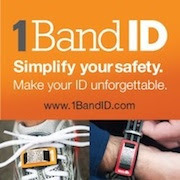 I gave mine back at the finish line to recycle it along with my safety pins. It's one the things the race does to be environmentally friendly. The tech shirt - awesome! This one will get worn in training frequently. Check it out. Very nice. It's also an eco friendly shirt too and very comfortable and fits true to size. 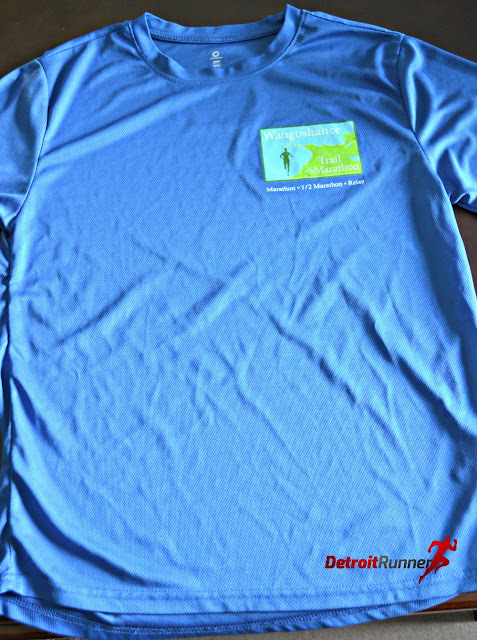 Back of shirt - no sponsors! The medal is the same as last year. It would be nice to see a new design each year but nevertheless it is a great design and I appreciate getting a medal. The age group awards are sweet! I wish I were fast enough to get one. They are really cool looking, don't you think? Nothing new here. The race website is well planned out with all information needed. The directions to the start are easy. The course is well marked. The communication is mostly through Facebook. The race director is there every step of the way so he can address any issues if they did arise. The finish line was well organized. The volunteers knew what to do. A great job by Great Lakes Endurance putting together an outstanding race. Overall, one of my favorite courses to run. 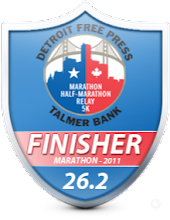 I've only done this race twice but I definitely plan to be at this race next year. The area is so fun and the camping is incredible. The shirts are great, the medals are cool. The race director knows what he's doing and listens to the runners to help improve things each year. I might need to start training hard in Winter to try and get one of those awesome age group awards. I will see you next year for this great race. I highly recommend this one. Plan far in advance so you can get a hotel or campsite early. 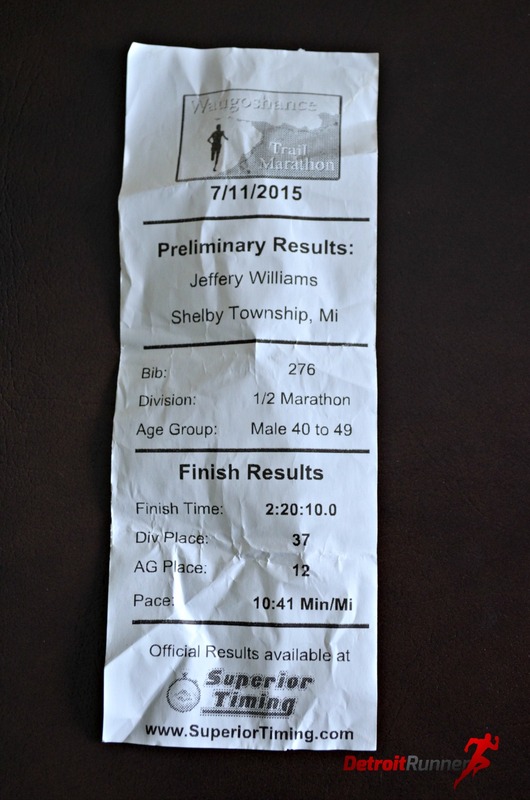 Disclosure: I received a discounted race entry in exchange for this review. All opinions are my own and I was not required to give anything other than an honest opinion. Loved this review...I'm so there next year! !